Clash of Pi is a global inter-school online circuit that encourages skill development and excellence in mathematics. Hosted by piCirql Math, a Singapore-based mathematics edtech firm, Clash of Pi has attracted the world’s best schools to compete and benchmark themselves, giving students the opportunity to assess themselves periodically and to achieve mathematics excellence through competition. While the student takes each monthly round of the circuit individually, they also form a part of their school team. The top 10 scores per grade will contribute to the school team score. Clash of Pi is curriculum agnostic and encompass a broad range of curricula from around the globe. The mathematics topics covered on the circuit are largely grade appropriate. The rolling 12-month circuit runs through the whole year (with a break in March for the Awards presentation) and provides schools with a seamless mechanism to promote mathematics in their institutions. The goal is to encourage students to think and apply concepts, thereby building their proficiency in mathematics within a fun, exciting, competitive yet rigorous framework. One topic is not part of my syllabus this year. How can I answer the questions? Clash of Pi is a mathematics aptitude test and is not restricted to any one syllabus. There may be a few topics that may not have been covered at your school. However, the questions on the circuit are meant to stimulate and challenge your ability to apply what you have learned at school. As such, you will most certainly be familiar with more than 80% of the syllabus covered. How can I view the detailed syllabus for each of the topics? The questions would be from chapters and sub-topics covered in their previous and present grade. The questions would test their overall proficiency in the topic and ensure that their expertise is assessed adequately. Clash of Pi is designed to simulate global standardized tests (like SAT and ACT) and to promote practice and familiarity with the online medium of testing that has become the norm. All rounds are held online within a secure student portal. The circuit is divided into 5 domain rounds per year, which cater to specified disciplines of mathematics. This is done with a view to ensure proficiency in all areas of mathematics. Each grade has a specified domain calendar. A domain comprises 2 Qualifiers and one Final, over a 3-month period. Typically, each monthly round is conducted on a pre-determined weekend (Friday to Sunday). Participants of Grade 6 and upwards earn proficiency badges based on the bonus questions that they are able to answer. These bonus questions are generated by an algorithm that determines the proficiency of the student. The badges are as follows: Legend, Champion and Expert. Where can I take Clash of Pi from? Which devices can I use?  Clash of Pi is a purely online circuit. The test can be taken either from home or from school (as instructed by the school coordinator). On the scheduled test dates, you may login from any PC or laptop with a good internet connection. Clash of Pi is also mobile enabled, though we highly recommend using a PC or laptop for a seamless user experience. Are there any system requirements that I need to take care of before attempting the Clash of Pi contest? Clash of Pi works best on the latest versions of Google Chrome, Mozilla Firefox and Safari. Please upgrade your browser to the latest version before you start taking the test. Images and pictures in the questions are best rendered on the latest versions. Please DO NOT use Hotspot connections as they are quite unstable. We recommend the use of Broadband Internet or strong Wi-fi. I missed taking the test on the scheduled dates. Can I do that test as practice? No. The tests can be taken only on the scheduled dates. If you have missed taking a qualifier in a particular domain round, your score in the other qualifier will be taken. If you have missed a domain final, you will lose out 50% of your score. I am a top performing student in Class 5. Can I register for Class 6 Clash of Pi? In general, students must participate in their current grade level. However in exceptional circumstances, where the school agrees to do this on a one-off basis, we can consider having a student participate in a different grade. Please note that the final decision to allow a student to participate in a different grade than the current school grade lies with the organizer. I found the questions very difficult for my Grade. Can I transfer my registration to a lower grade? No, you will need to take up your grade appropriate test. Students participate as part of a school team. Since the school team score is calculated based on the Top 10 performances per grade, it is recommended that there are more than 10 students that represent the school in each grade level. If there are less than 10 students per grade, the school team score gets adversely affected. However, students from a school with less than the team requirements, may continue to participate and earn accolades for themselves and their school. The School team format brings about the excitement of a team sport, so that students collaborate and spur each other on to push their boundaries in mathematics. I am a home-schooled student. Would I miss out on any benefits as I’m an individual taking the circuit? The Clash of Pi Circuit is available for individual students and those belonging to a school. You would receive the same resources, tests and digital certificates. Physical certificates can only be sent to school addresses. We do not send physical certificates to individual home addresses. We have more than 100 students from my school participating in Clash of Pi but some grades are not adequately represented with the minimum requirement of 10 students. Will this impact our school score? Yes, Since the school team score is calculated based on the Top 10 performances per grade, it is recommended that there are more than 10 students that represent the school in each grade level. If there are less than 10 students per grade, the school team score gets adversely affected. Some of the dates fall on holidays when I’m travelling. How can I take the test in such instances? Since each monthly round comprises a 15 minute online test, this can be easily taken anywhere. All you need is a stable internet connection. One of the Rounds is during my exams. Will you be able to change the dates? No, the dates cannot be changed. Clash of Pi Qualifiers are scheduled (typically) on the 3rd weekend of each month and the Finals are on the 1st Saturday of the month. The dates are published at the beginning of the year. Date changes cannot be accommodated for any reason. Can I have a retest after the contest is over? No, there is no provision for a retest after the contest period is completed. There are 25 questions to be answered in 15 minutes. Each question carries 4 points. Students may choose to skip questions or answer them. There are no negative marks for skipped questions. However, students cannot go back to skipped question at any point. If you complete 25 questions inside the time limit, there will be no additional questions served. Bonus questions may be introduced from time-to-time, which may carry extra points. There can be a maximum of 5 bonus questions per monthly test. Each bonus question is allowed one minute, and earns 10 points. It is not necessary for every student to receive a bonus question. Based on our proprietary algorithm, bonus questions will appear for select students based on their performance on their test. The bonus timer appears as a separate timer. The original test timer will be paused while the bonus question is attempted. If you submit your answer to the bonus question before 1 minute, you will be taken back to the original test, or you will be timed out as the case may be. How is the score for each domain calculated for a student? A domain comprises 2 Qualifiers and one Final, over a 3-month period. How is the school score calculated? What type of report will the schools get? Will all students get a participation certificate? Yes, all students participating in the contest will receive digital certificates. Global/National Rank holders are awarded physical certificates, which are distributed at the school. You can view your results within one hour of submitting your test. The results will also be emailed to your email id. The Top 10 in each grade are published on the website at https://www.picirql.com/leaderboard. This is a live leaderboard and gets updated every few minutes. The final winners are declared on the Monday after Clash of Pi. What are the awards for each domain? Are there any prizes for the Clash of Pi Circuit after completion of all the domains? Winners may be presented with Awards at the end of the academic year. School Achievers are awarded with special prizes in February/March after the end of the yearly circuit. The cumulative performance of a student is taken into account in order to become eligible for the School Achievers List. Is my login the same for all the qualifier rounds of Clash of Pi? Yes. Your login ID remains the same for all the qualifier and final rounds in the rolling 12 month period. My name is spelt incorrectly. How can I change it? Please write an email to [email protected] with your Correct Full Name, Misspelt Name, Class, School Name and Login ID. We will update the details. You can view the changes on the student portal. My grade is incorrect. How can I change it? Please write an email to [email protected] with your Full Name, Login ID, Class, Incorrect Class, School Name and City. You can view the changes on the student portal.